Home / Beth Bence Reinke / Darrell Wallace Jr. / Faith on the Frontstretch / Martinsville Speedway / NASCAR Camping World Truck Series / Faith on the Frontstretch: Who gets the glory in your victory lane? Faith on the Frontstretch: Who gets the glory in your victory lane? at Martinsville Speedway on Oct. 26, 2013. 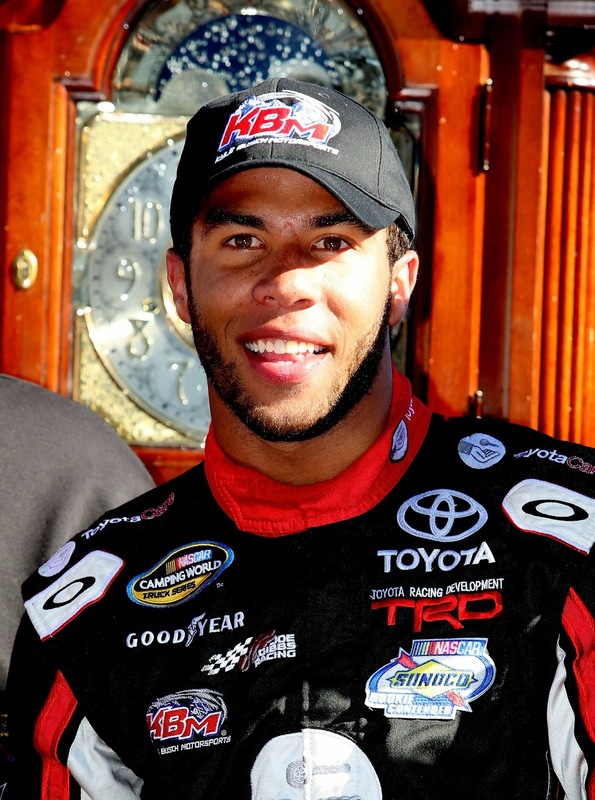 Darrell Wallace Jr. made history by winning the NASCAR Camping World Truck Series race at Martinsville on October 26, 2013, driving for Kyle Busch Motorsports. Overwhelmed with emotion, the young driver displayed both smiles and unabashed tears in victory lane. In his post-race press conference, Wallace Jr. summed up his feelings on the win in one sentence. Wait a minute. Did Wallace Jr. really say he could not have accomplished this historic win without God’s help? Yes, he did. Some might find his perspective perplexing and ask questions such as: Why give God the credit? The “good Lord” didn’t drive the No. 54 truck to the checkered flag. Bubba and his team earned that win. Isn’t it our own gumption and effort that gets things done? For people who don’t believe God exists, it makes perfect sense to think every person’s accomplishments come solely from their own efforts ... and maybe a little luck. Some believe even if God does exist, that we’re tiny and insignificant from his viewpoint, like ant-sized humans observed from a hot air balloon or helicopter. But those who have faith in God have a completely different perspective. We believe God deserves praise and recognition for every good thing in our lives, starting even before we were born. First God created each of us, gifting every person with abilities and talents to do things in this world, like sing or build furniture or drive a racecar. Then, as we respect and honor Him, we receive his guidance and help throughout our lives. We say “the good Lord” because we know He is truly good. There is simply nothing or no one who even compares to His goodness. On top of those “lights in the heavens” we call stars, He created all kinds of other good things around us – oceans, gorgeous sunsets, cool thirst-quenching water and oxygenated air to breathe. He gave NASCAR fans everything we need to enjoy a race at home – including eyesight, hearing and a functional thumb to press buttons on the remote. Since He showers us with day-to-day basics we often take for granted, how can we claim credit for the big-time blessings we receive? When you win in the race of life, whether you praise God or hog the glory for yourself is a personal choice. The next time you chalk up a victory, who will you offer the credit – lady luck, your own cleverness or the good Lord? Nice to see a young man with true faith, he just got a new fan in truck racing. Amen and well said! When take a moment and look out over a mountian vista we have to ask ourselves "What is man that God is mindful of Him" Yet He so loved the world that He gave His only Son that whoever believes in Him shall not perish, but have eternal life" What a promise that we can trust! Gracias por otra publicación fantástica. ¿Dónde más podría alguien obtener ese tipo de información de una forma tan perfecta de escritura? Tengo un discurso la próxima semana, y estaba buscando más información por Juegos Friv Gracias!